Odaiba was an enjoyable stop on our last day in Tokyo. It has so much to offer that we couldn’t fit it all in. We’ll have many new things to check out next time! Below are 5 fun things to see or do if you find yourself in this Tokyo district. Rainbow Bridge – This bridge is very beautiful at night, especially when seen from Odaiba Seaside Park. We had a stunning backdrop with Tokyo Tower and much of the city, as well as the bay full of Yakatabune boats. It was difficult to leave this view behind. 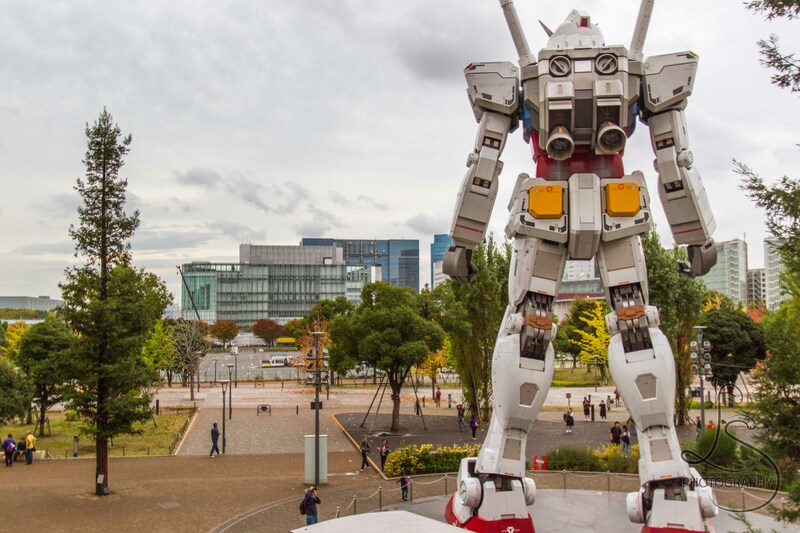 Gundam Statue – We saw this during the day and thought it was pretty awesome. When we stopped by at night, we were amazed to see it illuminated with its head moving back and forth. We thought it would be a whole new level of cool if it moved and couldn’t believe that it actually did. 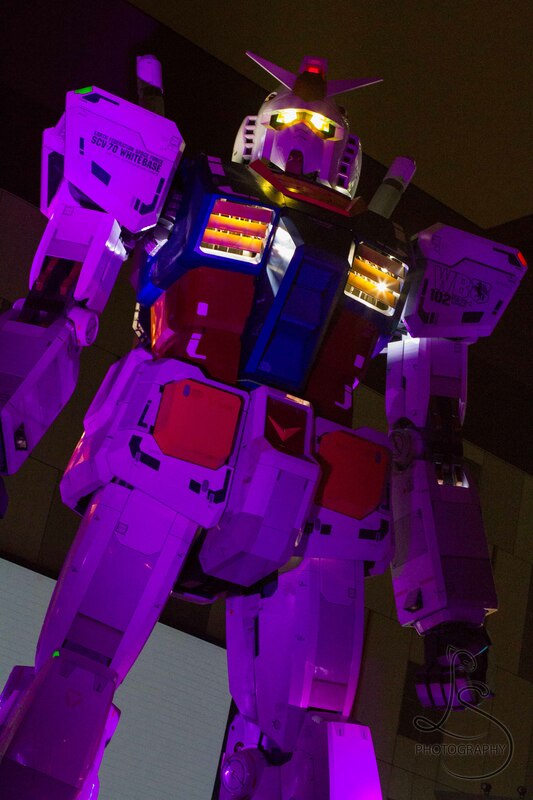 Near the statue, they played a Gundam video projected on the side of the Diver City building which added to the experience. The Statue of Liberty (Replica) – As Americans, we have always wanted to make it to New York to see the Statue of Liberty. Since we haven’t made it to New York City yet, this was a fun and unexpected sight. It is tiny in comparison – and it’s based more on the French style than the American version – but it was still fun to see and include in our pictures. The Fuji TV Building – This is one of the most futuristic looking buildings we have ever seen. We didn’t go inside, although it apparently has a lot to offer from shopping to views. The best part was seeing it at night from the water. We caught the city during illumination season, and different colors and shapes danced across the side of the building. We really enjoyed the light show. Odaiba Seaside Park Walking / Cycling – There is a bike path that goes around much of Odaiba through various parks that is about 7km. It has amazing views and is a great way to see the landscape of Tokyo along a beautiful shoreline. If you don’t have a bike, you can rent bicycles in Odaiba or nearby areas. We did a bicycle tour which stopped in this area for lunch. We had a great time enjoying the sites right on the water. Honorable mention: Ooedo-Onsen-Monogatari – This is technically a sentou, but you can’t go wrong with a day of pampering, no matter what you call it! Have you been to Odaiba, and if so, what are some things you experienced while you were there?